National Margarita Day is on Sunday, so what better excuse is there to enjoy a nice, cold tequila beverage? We've rounded up this collection of bars and restaurants — easily organized by Austin neighborhood — where you can sip a margarita (frozen, rocks, flavors included). Adjacent to the Alamo Drafthouse on Slaughter Lane you will find this tantalizing tequila oasis, which has everything from apple, mango and hibiscus to the classic lime margarita. We suggest trying an agave flight, which also comes with a refreshing sangrita option. La Fuente's Mexican restaurant in Sunset Valley has a delicious array of classic margaritas, from lime on the rocks to a frozen strawberry. Enjoy a drink (or two) in the beautiful outdoor seating area. Odd Duck is currently offering a frozen tequila mix called the Smokey Robinson with mezcal, apple shrub and agave. And although it's not a margarita, it's worth mentioning that Odd Duck also has an Odd Fashioned, a tequila version of the classic bourbon cocktail. ​Could we really make a list of margaritas without including Curra's? At this great Austin establishment, go bold and give the avocado margarita a whirl. You want fresh? This east side lounge will give you fresh. Slurp up the Margarita Fresca, made with quality tequila, all fresh juice and a dash of agave nectar. Arguably the true home of the Mexican Martini, this Austin eatery serves up a classic version of this super-intense margarita. It also comes in skinny, strawberry and spicy flavors, depending on what mood you're in. This ​elevated Mexican restaurant serves an entire menu of margaritas. Choose from several interesting combos or peruse the extensive lists of tequilas and mezcales for sipping. Consider this a grown-up take on the margarita. Jeffrey's signature 3 Guarantees features cimarrón tequila blanco, mezcal, Campari, grapefruit and lime juice. This Brazilian food restaurant just north of campus has a bevy of frozen margaritas. Go for happy and complement your marg with Sao Paolo's queso and to-die-for fried chips. Herrudura Silver tequila, Cointreau and fresh lime juice star in the Butterfly Bar's simple and classic margarita. In addition to an impressive lineup of cocktails, this east side hang offers one of the most impressive, secluded patios in town. The Pear Pressure from the cocktail stalwarts at drink.well. takes the margarita to the next level. Pear maple syrup, cardamom bitters and tequila create a perfect concoction. Who could pass up the Juicy Lucy? Try this fried chicken joint's frozen watermelon margarita, an ode to summertime. 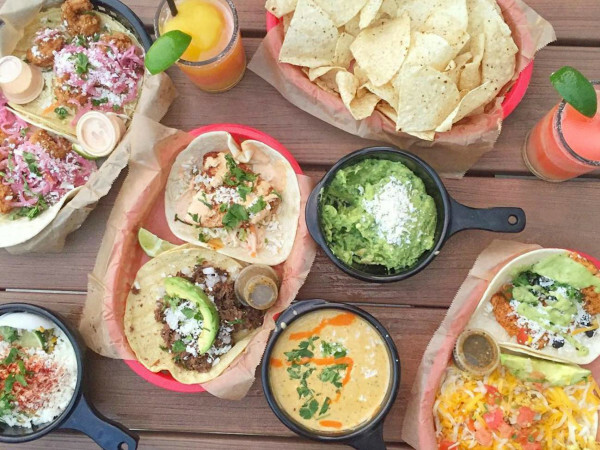 It seems like there's a margarita for every burger at Hopdoddy. This margarita lover knows you can't go wrong with the the Classic Frozen, the Doble Fina, the Sangrita or The Skinny Dip. Jardin Corona delights with traditional Tex-Mex offerings and plenty of margaritas. We're talking a full line of swirled flavors, including prickly pear, coconut and blue curacao.